The Big Easy is known for Mardi Gras partying and too-frequent flooding. Unfortunately, it appears that the remnants of those good times have been aggravating the city's water and sewer woes. Just this year, crews pulled 93,000 pounds of plastic carnival celebration beads from storm drains along a five-block stretch of St. Charles Avenue in downtown New Orleans. 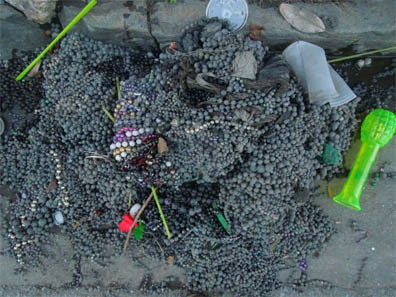 As the beads collect, the storm drains become clogged, and flooding ensues. This year, however, Dani Galloway, interim director of the New Orleans Department of Public Works, has made it her mission to keep more beads from clogging up the drains. The city has installed about 200 filter contraptions made of metal grates and orange sandbags along parade routes to catch the bead necklaces before they become a mass of plastic waste. Since last September, Compliance EnviroSystems crews have been flushing out more than 15,000 clogged catch basins under a $7million emergency contract. Hard Rock Construction has been repairing faulty catch basins under a $17 million contract. There are about 65,000 catch basin in New Orleans that are the responsibility of the New Orleans Public Works Department. The Sewer & Water Board doesn't do catch basins - they are only responsible for drainage lines more than 36-inches wide. Catch basins are usually covered with grates, but the city reports that the covers are sometimes stolen for scrap. With no cover, debris easily finds its way down into the catch basin, then continues into the drain lines which, when blocked, results in expensive repairs that require street work as well as waste water jobs. Unlike other cities that combine their sewer and drainage systems, New Orleans' drainage needs are so great, the drainage system was built separately from the sewer system and uses different equipment.